August 30, 2018 (San Diego) - California Coast Credit Union and San Diego Zoo Global have partnered on a promotion thanking area firefighters with free admission to the San Diego Zoo Safari Park. Firefighters and up to three guests will receive free one-day admission during the month of September. CORY IVERSON'S WIDOW TO GRIEVING FIREFIGHTERS: "USE THIS NIGHTMARE TO HELP OTHERS"
December 24, 2017 (San Diego) - Ashley Iverson slowly inhaled. Then she let out a long breath in front of 1,800 mourners with their hearts in their throats. “Just breathe is what I told one of my best friends when she lost her soulmate at the age of 22,” Iverson said at Saturday’s private memorial service for her firefighter husband Cory at The Rock Church in Liberty Station. Read more about CORY IVERSON'S WIDOW TO GRIEVING FIREFIGHTERS: "USE THIS NIGHTMARE TO HELP OTHERS"
October 20, 2017 (San Diego) -- As Firefighters in Northern California continue to make progress on 9 large wildfires burning across the State, the true magnitude of the devastation of loss of life and property is beginning to come to life. This recent series of fires is the deadliest in California State History. Since the start of the October Fire Siege on October 8, there have been 21 major wildfires that burned over 245,000 acres, forced 100,000 people to evacuate, destroyed 6,900 structures and sadly took the lives of 42 people. July 29, 2014 (La Mesa)--Firefighters from La Mesa’s Station 12 called police yesterday at 5:51 p.m. to report finding a man in their secure parking area who was burglarizing their personal vehicles. As La Mesa Police officers responded, the suspect ran away and hid in the garage of a nearby home – where he began stealing items in the garage. FROM THE FIRE CHIEF'S CORNER: IS THAT A HAZARDOUS MATERIALS INCIDENT OR THE FLU? March 17, 2014 (San Diego)--During a hazardous materials incident, firefighters and first responders isolate the area and deny entry to keep it contained. The same goes if you have the flu. Both are toxic and pose an unreasonable risk to our Health, Safety and Environment! Isolate yourself and stay away from others because it spreads through contamination. Read more about FROM THE FIRE CHIEF'S CORNER: IS THAT A HAZARDOUS MATERIALS INCIDENT OR THE FLU? February 23, 2014 (Rancho San Diego) – Jennifer Hanna snapped these images of a brush fire behind her home on Sunday, February 16. The blaze, near Fury and Wieghorst in the Rancho San Diego area of El Cajon, was swiftly dowsed by firefighters. August 8, 2013 (El Cajon) – In the shock that followed the Sept. 11, 2001 terrorist attacks on New York City and Washington, D.C., partners Mary Carouba and Susan Hagen sat stunned across the country in California. After a while it dawned on them that whenever they turned on the television, there were news stories and other acknowledgments about the men who were the first responders at the World Trade Center. Always the men. Weren’t there any women there? Carouba recalled that New York City Mayor Rudy Giuliani, standing on the rubble of the World Trade Center, asked for a round of applause for “the men we lost” as well as for those other men who helped people to survive the collapse of the Twin Towers. Later, President George W. Bush came to the site of the tragedy to praise “all the men,” Carouba related to a convocation of classified employees Thursday, Aug. 1, at Grossmont College. 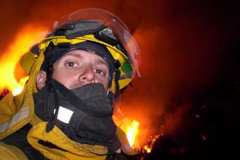 May 24, 2012 (San Diego) -- Not long ago the public praised San Diego firefighters and other first-responders for protecting our lives and property from the wildfires that raged across our county. Today the taxpaying public stands to lose as all of our city employees are being pushed aside by politicians attempting to further their own ambitions with ballot Proposition B.
February 17, 2012 (Lakeside) – Toby, a Shiba Inu dog belonging to Lakeside resident Tim Ellis and his wife is free, thanks to the efforts of Lakeside firefighters. While chasing a squirrel, the dog got its head caught between rocks in an artificial waterfall. October 2, 2011 (El Cajon) -- The El Cajon Fire Department is holding a safty and career expo on Saturday, October 8 at 100 East Lexington Avenue in El Cajon from 10 a.m. until 2 p.m. There will be a special tribute at noon for firefighters, police, and military heros. During the day, many activities will be available for family fun as well as teaching the public how to be safe and prepared for a fire or other emergency. May 17, 2011 (Casa De Oro) -- A fast and effective attack allowed San Miguel firefighters to extinguish a fire that started in the kitchen of an upstairs apartment unit in the Casa De Oro area across the street from Spring Valley Middle School. Fire damage was confined to that single unit. Crews were called to the Helix Square Apartments on the 3800 block of Conrad Drive at 11:21 a.m., Monday. The fire was considered knocked down ten minutes later. Inside the residence at the time of the fire was one adult male who evacuated the upstairs apartment, but was treated on the scene for smoke inhalation. He was later transported to Grossmont Hospital. November 4, 2009 (Sacramento) -- Beginning next year, firefighters, medics, and others responding to state emergencies will be able to vote wherever they are serving, thanks to the Governor's signature on Assembly Bill 1440 (Swanson), which Secretary of State Debra Dowen sponsored in the Legislature.